There’s an impression that fishing vests are for fly anglers. This isn’t true. Fishing vests are useful for all anglers, whether you’re fishing with a fly or soaking bait in saltwater. I never go fishing without my fishing vest because it helps me be a better fisherman. It can help you too! When you bring a tackle bag to the water, in most cases you’re bringing more gear than you need to bring. 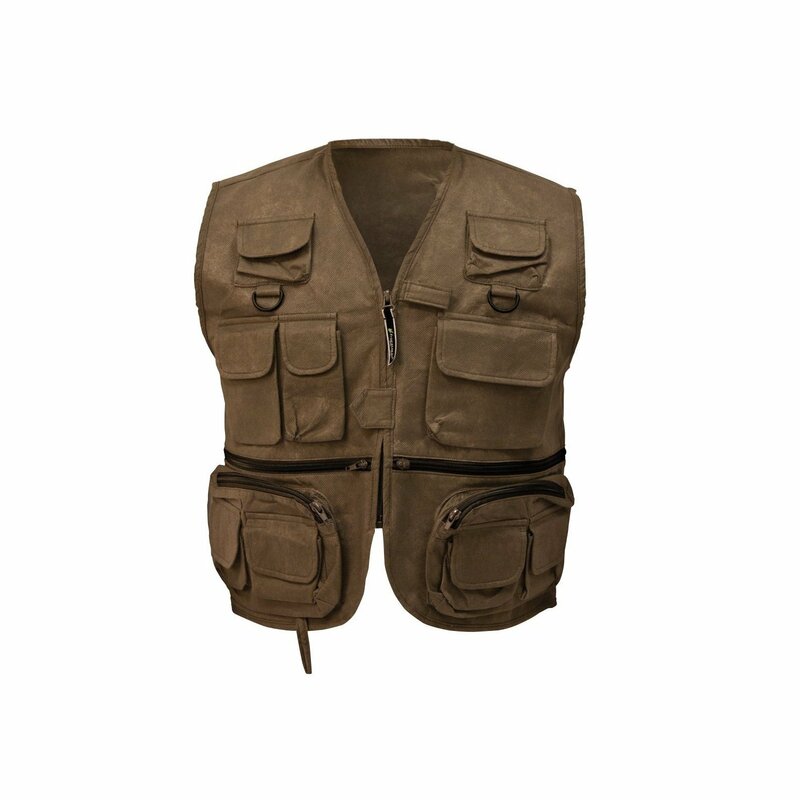 With a fly fishing vest you can carry all the tools, lures, and tackle that you will need. How much gear do you need if you’re only going to be on the water for one to three hours? Learning how to go fishing with only what you need will help you reduce the amount of stuff you bring and force you to go fishing with a real plan and to stick to it. You can always stash extra gear in the car in case you need it. But I can almost guarantee you that you will rarely ever need the extra gear once you get good at planning what you need. This is my fishing vest. Notice the D-Rings on the chest and the big pockets accessible by zipper. I use one of the large pockets of my fishing vest for pliers and the other big pocket, on my right, for a pair of gloves and a rag. 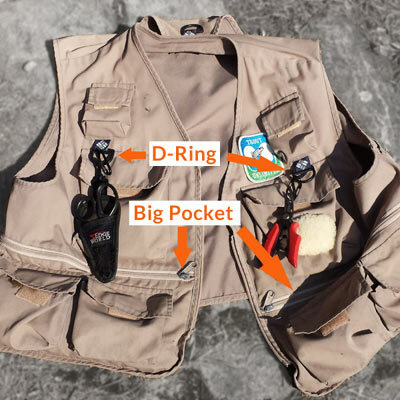 My vest has two D-rings, one on each side of the chest, that I use to attach a Mustad combination line cutter/split ring tool and leave one unused. The rest of the pockets are used for carrying essentials like split shot, hooks, beads and leaders. Lures are kept to the absolute minimum and I rarely carry lures in my fishing vest. I bring a small soft sided cooler and slip a box of spoons or other small items into the cooler pockets. The key is to carry as few lures as possible. So I’ll have what’s rigged on the fishing rods plus a minimal selection of spoons, a couple bags of small soft bait and maybe a couple hard bait. Whether I’m fishing saltwater or freshwater, I always wear a fishing vest. When I’m saltwater fishing I may put a pair of bigger pliers into my large vest pocket. But sometimes I just clip it to my belt. The pockets are good places to stash gloves, the line cutter on the D-ring, a rag, and sometimes an extra bag of clips and swivels. It’s just handy to have things right there on your person than having to drop what you’re doing and walk over to a tacklebag. Zippers must be high quality. Make sure they function well and aren’t flimsy. Choose a vest that’s two sizes bigger than your normal size. For instance, if you’re a size medium, get a size extra large. What is the Best Fishing Vest Material? Cotton is a fine material. But it does not dry as well as polyester or nylon. Cotton does not wick away moisture, which can make you feel uncomfortable on a humid day. My personal preference is for a cotton polyester mix. A light tan colored vest is a good choice because it will reflect away some sunlight. A dark colored vest will retain heat and make you feel hotter on warm days. My preference is for light colored fishing vests. I know some people like camoflage as a color and believe there is a benefit to blending in to your surroundings. But if blending in made you a better trout angler I think cranes would be camoflage instead of white, the brightest and one of the most noticeable colors of all. The fact is that trout react more to your movements and to the sounds you make in the water. That’s why cranes move slowly and with a light step. The best anglers know that moving slowly and lightly is a key to catching more fish when the water is clear and the fish are able to sense you. An old fly fishing guy told me that the ideal fishing vest size is about two sizes larger than your normal size. So if you wear a size small shirt, choose a size large vest. I’m a medium and my favorite fishing vest is a size extra large. Most fishing vests are cut short. So when you buy a vest that’s your exact size, the bottom of the vest will about where your rib cage ends and your belly begins. When you read reviews of fishing vests you’ll see lots of complaints about vest sizes running small. The reviewers are wrong. The vests are not cut one size too small. All fishing vests are purposely cut short. This is by design and for a good reason. Fishing vests are meant to be worn while wading in lakes and rivers. That way you can be up to your waist in water and your vest will not get wet. Buy a Fishing Vest One Size or Two Sizes Larger? You can buy a vest that’s one size larger than your normal size and it’ll work. But, two sizes up will make that vest all-weather fishing vest. It won’t look large because remember, fishing vests are cut short. The reason to buy two sizes larger are that the larger sizes allow your body to move around more freely. When you’re casting, reaching down to pick things up, hopping and scrambling over walls and logs, a loose fitting vest allows your body the full range of motions. I never feel constricted or held back by my fishing vest. You know you made the right choice when you forget you’re even wearing a fishing vest. Another reason to up-size by two sizes is because it can fit over a jacket. This comes in very handy on cold or rainy days! The same vest you wear in the summer time is useful on colder days when you’re bundled up. Frogg Toggs makes a water resistant fly fishing vest called the Cascades Classic 50. It’s made out of a material that has micro-openings big enough to let warm air out but small enough so it doesn’t let water in. The material is light weight like their rainwear. Some people feel it is flimsy and paperlike. Yes, it does feel like paper, and I wouldn’t go marching through brambles with it. But because I wear it as intended, I have had no problems with this material. This is a Frogg Toggs Cascades Classic 50 fishing vest. This is an ideal vest to wear in the rain or on a hot day. And it only costs about twenty dollars! Click the image to view on Amazon. This site uses Amazon affiliate links. Any purchases help support BaitSoaker.com. 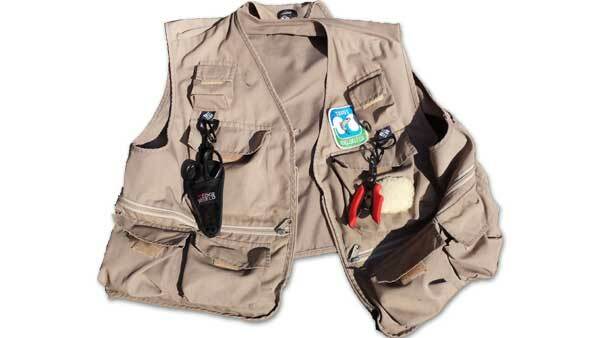 The Frogg Toggs fly fishing vest is one of my favorite vests to wear on hot days because it breathes. When I say it breathes, that means that the hot air and moisture from your clothing will wick away, helping to keep you cool. And because it’s water resistant it works great under rainy conditions. The downside is that I feel self-conscious when wearing it to not be too rough with it. So I only wear this vest when it’s important to stay cool or I’m expecting a light summer downpour. For truly rainy weather, I usually keep my regular fishing vest beneath a rain proof jacket. I’m simply too rough with vests and in rainy conditions I don’t want to think about being easy on my clothes. On the plus side, the Frogg Togg fishing vest costs under $20. So it’s inexpensive enough to have around for the odd day when you really want to keep cool and comfortable. 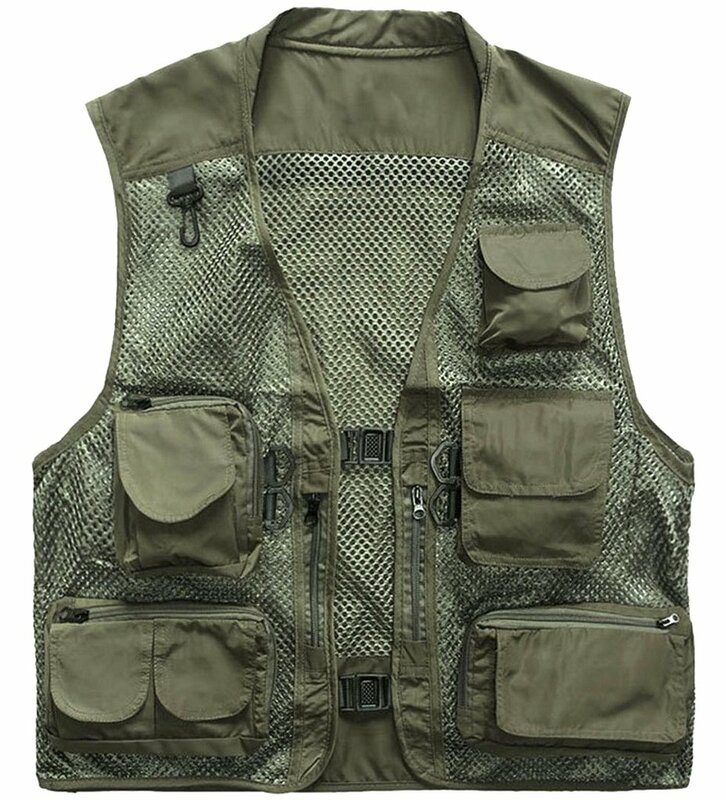 This is a mesh fishing vest. Mesh on the back of the vest is fine. But mesh in the front of the vest is a magnet for lure hooks. A mesh fishing vest will slow down your fishing when the hooks get stuck in the mesh. I do not recommend mesh fishing vests for that reason. A mesh fishing vest seems like a good choice for hot days. But I don’t own one. The reason I don’t wear mesh fishing vests is because I have enough trouble with hooks stuck in fishing nets or in my shirt sleeves. I don’t want to add to that headache by getting lures stuck in the mesh of my vest. It might work for other people, but in my opinion, mesh fishing vests can contribute to delays in fishing. A vest should always help keep you on the water fishing. Having to stop to work a hook out of a mesh vest is a nuisance. So I don’t recommend them. So there you have it, my reasons for why fishing vests are useful. I never go fishing without a vest. I’m confident that once you give it a try you’ll agree it makes fishing more convenient. Fishing vests are not just for fly anglers. I’m certain you’ll get years of fishing fun out of a good quality vest.